Who knew the stock market was volatile? 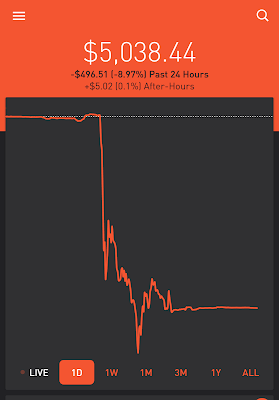 My portfolio went down $496.51 today. I don't use the term "I lost" $496.51 because I didn't sell any of my positions. You only lose money if you sell for lower than what you bought it for. My hope is that my options go back up in value, I will sell the options, and go back to buying dividend stocks. Tomorrow, I will post the 2nd video for making a budget. Here are my Missions this week. Start basic programming learning - I want to learn how to code, and from looking things up online, it looks like I should start with learning Python. - Technology. Not too many Missions, but when I have too many, they're harder to accomplish. This won't be my normal full investing update. I have some spreadsheets and numbers to reconfigure, and that might take some time. My Robinhood portfolio ended this week at $5,313.62. I don't have a count on my dividends for the year so far, because I stopped tracking it. I'll spend some time getting everything updated. My plan in the next few months is to sell some of the options I have, and go back to dividend investing. I know this isn't as detailed as my normal investing updates, but we'll get the ball rolling again. I got a notification today on the Robinhood App that I could buy two additional Cryptocurrencies - Litecoin and Bitcoin Cash. I honestly don't understand everything behind Crypto currencies, and I couldn't tell you why I bought Litecoin and Bitcoin Cash vs continuing to buy regular Bitcoin and Etherium. The Fear of Missing Out (FOMO) is real, and I bought $10 of Litecoin and $10 of Bitcoin Cash because it was new and I didn't want to miss out. 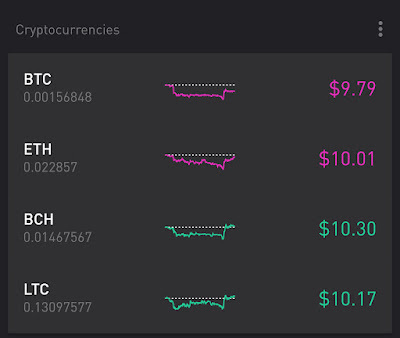 From the picture above, you can see where the equity is at of my Cryptocurrencies in my Robinhood App. So far, I've bought $10 of each Cryptocurrency. I don't foresee adding much more money to Crypto, but I have my toes in the water, and will be able to watch and learn how trading Crypto works. I don't have a ton to talk about tonight, but I still want to post. I'm in a pretty good place with minimalism. I have most of my apartment sorted through, and all like items together. This is the first time I've had this in probably 5.5 years. Investing is going pretty good. I'm not going to buy any more options on Robinhood, it's just too risky for me. I'm also contributing to my Roth IRA again, so that's good. Technology. I'm very happy with my Google Pixel 2, it's probably the best phone I've ever owned. I'm working on my hard drives/storage, and I'm making progress. Conservation. This one is and has been always the hardest to talk about. I have no updates. Health. I had my tonsils out this summer and I'm feeling so much better. My tonsils had been swollen for over 6 months and I decided to have them removed. It was a painful recovery, but I'm feeling a lot better. So that's an overall update for the MITCH categories. 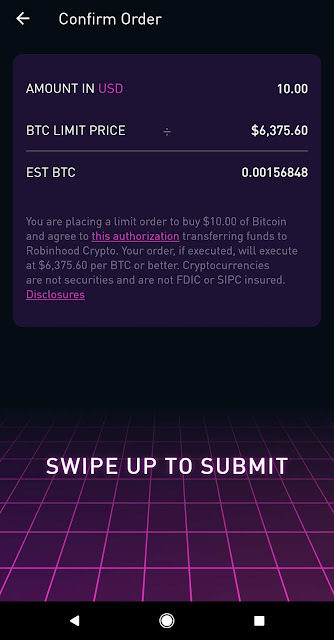 I bought $10.00 worth of Bitcoin on Robinhood today. I didn't need to buy it, but I did anyways, because I love the Robinhood App and I want to try out all of the features available. 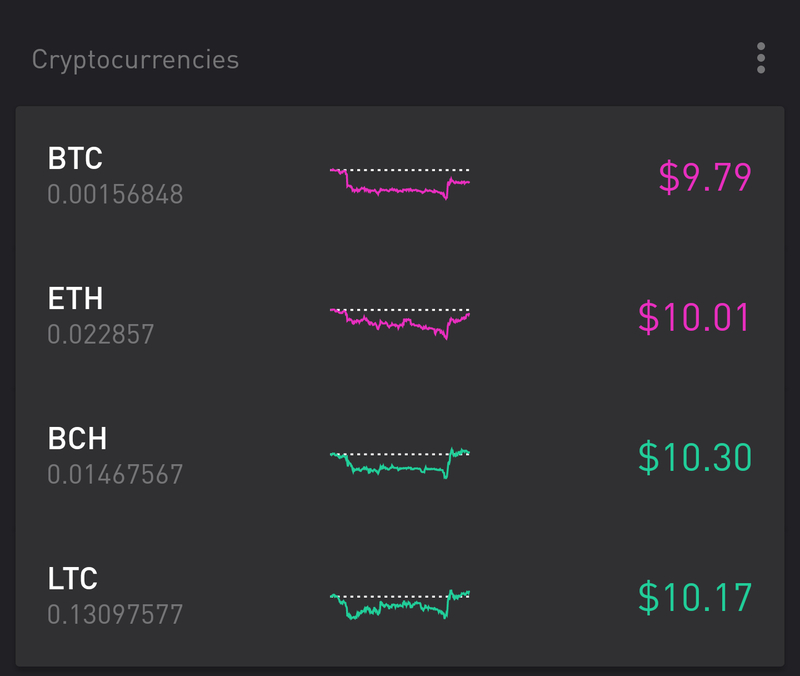 What's nice about having crypto on Robinhood is that I can now remove my crypto from other platforms, which results in fewer usernames/passwords to remember. As of right now, you can't send your bitcoin to other people, or buy things with it, it's just for trading. I'm not sure what Robinhood's plans are for the future, but with the other platforms that I've bought Bitcoin with, you "own" the actual bitcoin and are able to send it to others or other platforms. I'm not expecting outrageous gains with this purchase, but it's fun to watch and keep track of while I'm already checking my stocks on Robinhood. It looks like I'll be getting five dividend payments this week. If you think about it, I'm getting paid five times this week. Total dividends this week - $1.60. This is an irregular week since PFF, O, SDIV, and DIV all pay dividends on a monthly basis. I am shifting back to the safe and (mostly) consistent strategy of dividend investing. I tried out some options on the Robinhood App, and it's too volatile for me, even with stocks that I'd consider not super volatile. I'll get back to my regular Friday stock updates soon. I also have Google Drive, Dropbox, and iCloud storage. Ideally, I would only have one online cloud storage, probably Google Drive, and one main external hard drive that centralizes everything (sort of like a server). I would like to have a drive where I can save all of my video projects on, so I can get them off iMac. My iMac has been running slow, and I need to get a bunch of files off of it. Get all of the files off of the Maxtor Drive, since it doesn't stay connected for more than 15 minutes at time. Move the files to the 1 TB drive. Clear out the 250 gig WD drive to the 1 TB drive. Clear out the 128 gig SSD to the 1 TB drive. Sort through the 1 TB drive and remove duplicate/unnecessary items. This is a plan to get me started. Well, for the first time in 2018, I "jog-walked". I don't use the term "running" unless I'm actually running. Back in the summer of 2013, I used to jog/run almost every night. I can't believe it's been five years since that summer, a summer that was very transformational for me. I worked really hard to get my running up that summer and I let it all go. I jog-walked 2.00 miles at a pace of 16:55 min/mi, which yes, is basically walking. I did have spurts of jogging, which I need to work myself back into. This will be my baseline, and I will try to improve it every day. I need to get new shoes for being outside, especially at the weight I'm at. Any stress I can alleviate from my knees is needed! I made progress tonight, and I will use this blog to maintain my progress of getting back into "running". A lot of things have changed with my Robinhood Portfolio. I ended up selling my AT&T stock (Stock Ticker T), and I've repurchased that stock. I bought one share of T for $32.65. Below is my dividend history while owning T.
The upcoming dividend is $0.50/share. The ex-dividend date is this Monday, July 9th, so if you wanted to get this latest dividend, you would have needed to bought shares of T by today. $2.00/year in dividends / $32.65 purchase price = 6.13% dividend yield. Nice. Lets say in five years, following the trend of AT&T increasing their dividend by a penny a year, each quarter's dividend would be $0.55/share. $2.20/year in dividends / $32.65 purchase price = 6.74% dividend yield. I'm not saying this is going to happen, because the future of stocks is unpredictable. Do you own AT&T stock? Try to not be so hard on myself. Make my apartment a little more like home. Intentionally put days off on my calendar. Be nice to people above all else. I've been actively trying to do these things, and it is helping to make life better. I'll keep making these efforts. Today is the a holiday in the United States, the 4th of July or Independence Day. I didn't do a whole lot today as I wasn't able to travel home for the holiday. I personally don't get excited for the loud noise and congestion of trying to watch fireworks in large, congested area. I decided that today would be (the start of) my independence day from using credit cards and wasting money. I'm going to start transitioning away from using credit cards (Thanks to advice from Dave Ramsey). I'm also going to stop recurring subscriptions that I don't fully utilize or need anymore. I cancelled my Amazon prime subscription. I really wasn't buying anything on Amazon too regularly, and all of their cloud services, I use the Google equivalent. I also need to evaluate cloud storage subscriptions and which ones I should keep. I have three right now (not good), and I need to cut back. The good thing is, I've made a pretty good budget for July 2018, and in the four days of July, I've tracked all of my expenses so far! (This was to be read in a sarcastic voice, because four days isn't very long) It's a good start, and I think the excel spreadsheet I made is simple enough to track my expenses the entire month. To summarize, I'm trimming the fat of my spending, and I'm tracking all of my expenses this month. This is all done in an effort to be "independent' from debt. At night, when I'm brushing my teeth, I'll usually "watch" (listen) to these videos, and it gives me motivation to do better financially. From his advice, I'm considering not using my credit cards anymore. He makes a good point that the cash back bonus you get from a credit card is probably less than amount you'd save by spending cash instead of a credit card. I agree that Dave has a point with this. I dislike giving up cash and seeing it leave my wallet. I don't care as much when I use a credit card to pay for something. Dave also doesn't care about credit scores. I started thinking about why I care about raising mine back up so much? (My credit score tanked after my house got foreclosed on). I won't need a credit score again unless I'm going to buy another house, which is going to be a loooooong time for me. It's nice to hear a different opinion about credit cards and finances. If you want a different perspective about finances, give Dave a listen. 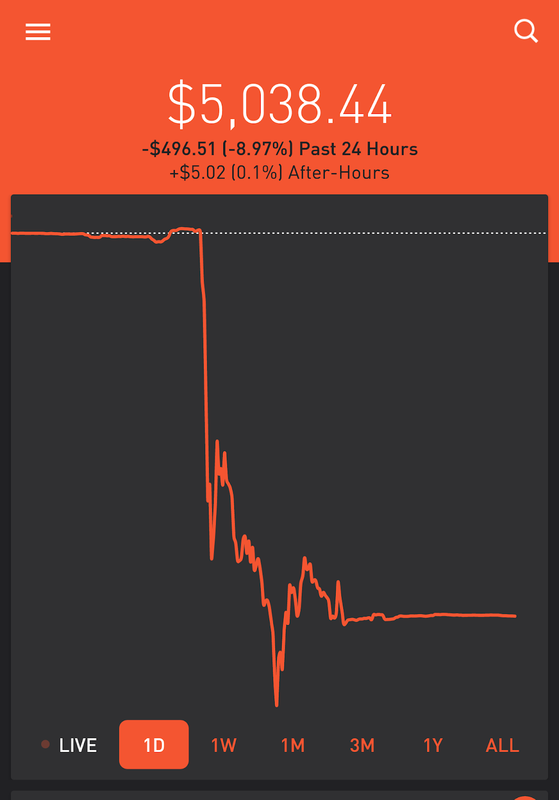 I jumped into Crytocurrency about a month ago, and wow did I pick a bad time to do so. Bitcoin, Etherium, Litecoin, and Bitcoin Cash, (Crytocurrencies that I became more familiar with) all dropped in price by a large percentage in the last month. I was excited for Crypto because I could trade stocks 24/7, outside of the current 8:30 AM - 3:00 PM time frame. I was also excited because it doesn't have Pattern Day Trader rules/requirements. In the regular stock market, if you have under $25,000, you can't pattern day trade (I guess you can, as long as you don't have any type of margin account, and you wait three days for your funds to settle). I was looking at Crypto as a side hobby to do some fun trades and to make a few bucks. I'm DOWN a lot of "BUCKS" right now. I guess I'll sit and wait and hope Crypto goes back up. The risky thing is, there aren't the same reasons for a crypotcurrency price to go up compared to a regular stock. In the future, when Apple undoubtedly beats earnings expectations, the stock price will rise. This is due to Apple showing it is a profitable company. Bitcoin isn't a stock, and it's not a company. Bitcoin doesn't "release earnings". While I'm currently down in value on my cryptocurrencies, I'm still excited and optimistic for this technology in the future. In the meantime, I need to do more research. I've moved many times over the past 6 years now, due to graduating college and different job/life paths. I'm pretty settled in at my new location, and actually have most of my items unpacked for once. I usually never fully unpacked because I knew where I was living was temporary. It's nice to be more settled because I can actually feel (somewhat) settled physically and mentally. Hanging pictures of family and friends on the fridge. This has helped so much, and I always took it for granted at home growing up. My fridge growing up always had family and friends and I never took ownership of doing this myself for my fridges. Seeing real pictures of my family friends, and not digital ones, has raised my spirits. I have a spreadsheet that I've been using for over 5 years to track my student loans. Having the same spreadsheet for so long has helped to "ground me". I've been using the same form and working towards the same goal, paying my loans off, for over 5 years now. Going to the library and checking out books, even though I usually don't completely read the book, helps me feel more connected to my local community. If you're feeling unsettled in a new place, you can try doing these things. I believe there are a lot of things necessary to feel settled in a new place, but these are three things you can do on your own.